the Final game for the championship of the National football League (the so-called Super Bowl) for Americans what-то like a national holiday. The whole country is going to have TVs and sports-барах, advertising during the broadcast costing millions. Held February 3, Super Bowl is one of the sponsors — of the world network of fast food Burger King has not thought up anything better how to pay about $ 5 million for the right to use the fragment from the film 1982. In the documentary "66 scenes from the life of America" they were interested in only one, the most famous scene in which Andy Warhol eats a hamburger. More specifically, the "whopper" from "Burger king". In the early 1980-х years Danish Director Jorgen Years removed the film from several tens nothing to each other unrelated episodes in which the Americans did what-то simple, ordinary things. The dream of the Director was persuaded to star in the film of Andy Warhol. Jørgen Years came to the king of pop-арта directly to the "Factory" and, seizing the moment, offered him to eat on camera a hamburger. Warhol the idea to do that-то so common liking, he immediately agreed. The arrival of Warhol in the Studio, Summer has prepared a lot of burgers to choose from, but forgot about the Burger from McDonald's. Not finding the most beautiful symbol of fast food, Warhol eventually agreed to of the whopper "Burger king". So this brand fell into the cult scene at the end of which the artist said "my name is Andy Warhol and I just ate a hamburger." the Original scene lasts about 5 minutes, but advertising on the Super Bowl left 45 seconds. Accompanied it with the hashtag #EatLikeAndy — "eat like Andy". Advertising was recognized as one of the most unsuccessful in the history of the super bowl. Mainly because of the audience of fans of Andy Warhol and fans of American football almost no overlap. Football fans do not understand what this strange character, slowly eating a whopper. And fans of Warhol troubled by the fact that the episode of eating the hamburger their idol was reduced from it-де went all conceptual depth. 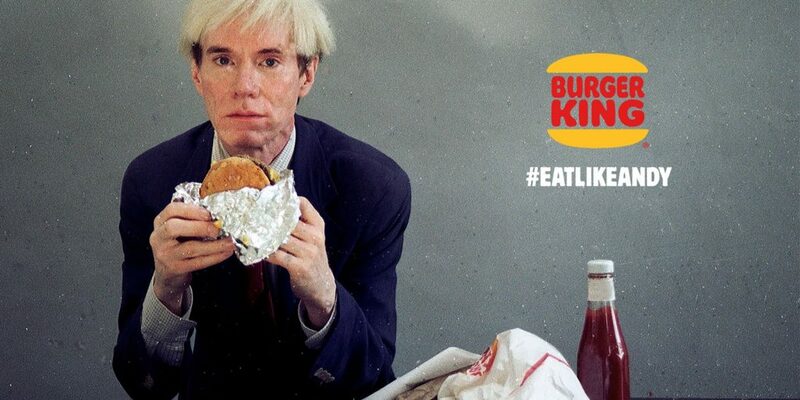 Gurus of advertising, wrote that the fragment is not extremely dynamic, what he saw is not clear at all that it is advertised "Burger king" and not, say, Heinz ketchup (Warhol is making efforts to squeeze the ketchup on the Burger itself). But to the Warhol probably would have liked. This is not impersonation so beloved of the principle of mixing "high" and "low" culture, the "elite" and "mass" art?